The instruction on this topic is only meant to provide a mechanism to focus on the more important topic, learning T-SQL. 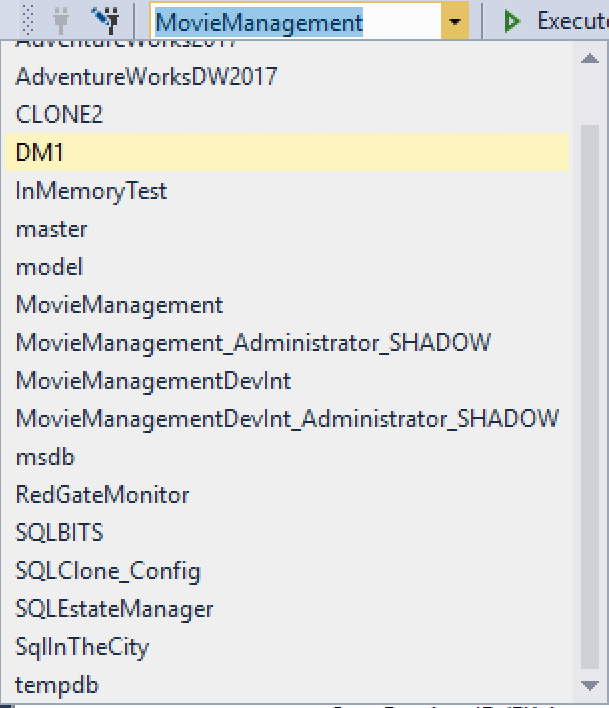 While SQL Server Management Studio (SSMS) provides a robust graphical user interface (GUI), the commands you're going to use the most to control databases and the data within them in SQL Server are going to be done through T-SQL. Therefore, you really need to spend time learning how to write, read, and edit T-SQL. Previous posts in the Fundamentals series have shown how to INSERT, UPDATE, and DELETE data using T-SQL. Next, we're going to learn SELECT. However, I want to show you a crutch you can use as you get started learning how to write T-SQL, the Query Designer window. The instruction on this topic is only meant to provide a mechanism to focus on the more important topic, learning T-SQL. However, this may be an easier path for some people to get started. 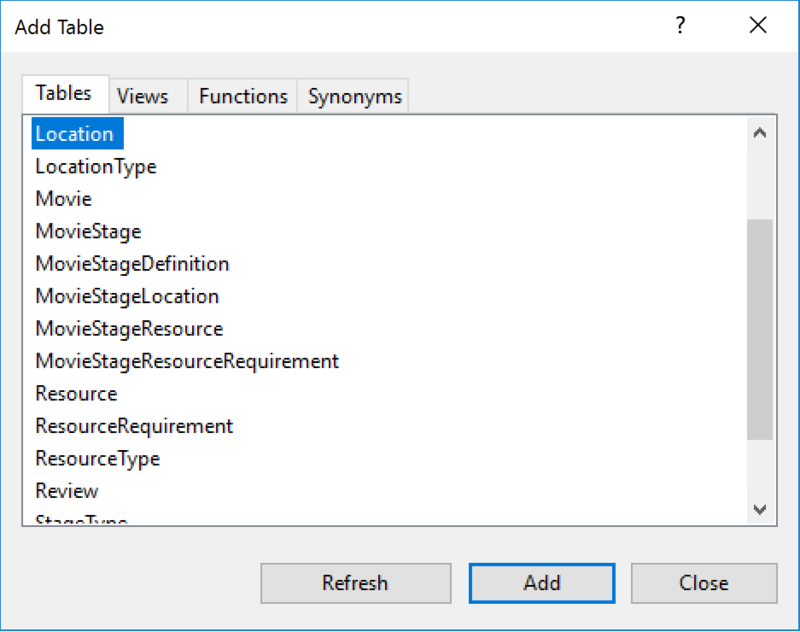 This shows you don't always have to navigate to the database in the Object Explorer window first. Remember, there are always multiple ways to get things done in SSMS. This window allows you to select the table that you would like to query. You can add multiple tables if you need to. You can also click on the tabs across the top of the screen and choose other types of objects that can be queried to the Query Designer window. Select a table and click on the Add button, and then click the Close button. 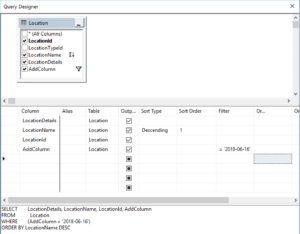 The Query Designer window opens with the table you selected. There are three basic areas that make up the Query Designer window; the Diagram, Criteria, and SQL. The diagram is at the top and includes any tables you've added. In the diagram, you can click on the checkboxes next to columns to pick which columns you'd like to include in the query. There's also the option to include all columns by using what is referred to as the star. 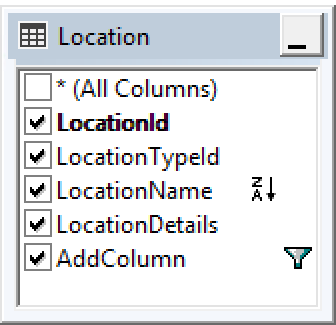 It's just an asterisk, but it's the code in SQL Server for everything when referring to columns. You can list each column or you can list them all by selecting the star. It's a best practice to always list each column, even if you are using all of the columns. It's considered poor practice to use the star to define the columns, even though that can be a little bit easier. As you click on the checkboxes next to the column names, you can see the other panes of the Query Designer window getting filled in. The same works if you deselect columns. The table in the window can be resized so that you can see all the columns and the full name. Note that the schema is not displayed in front of the table name, but is in parenthesis after the table name in the title bar of the window that represents the table. This shows the diagram pane with all the columns selected. Click on the OK button at the bottom of the Query Designer, and you'll see a full-fledged SQL statement in the query window, ready to be executed. However, what if you wanted to add a WHERE clause? That's where the second pane, Criteria, comes in to play. The Criteria pane allows you to manipulate the columns and add sorting and filtering. SQL Server never guarantees the order that data will be returned unless you provide specific sorting criteria through what is called an ORDER BY clause. The "Sort Type" and "Sort Order" columns in the Query Designer allow you to specify that value. For example, let's assume you need to order by the a time column and you want it in reverse order, showing the newest values first. First, you select the "Sort Type." In order to get the order you want, you need to select the value Descending. Then you can modify the Sort Order column if you are sorting by more than one column. In this case, only the one column is there. Note that the TSQL pane now shows code with the ORDER BY clause included. Finally, you'll need to look at the bottom pane; the SQL pane. This reflects all the selections that you've made above, but you can edit the SQL statement directly. For example, assume that for this query you actually don't need to see a column. 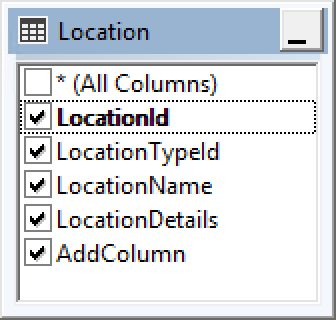 In the SQL pane, select the comma and the column and delete them. Now, if you click outside the SQL pane, you'll notice that the other two panes no longer have that column selected. So each pane can affect the others. The query defined shows the columns you selected in the SELECT statement. The FROM clause shows the table, including the schema, that you put into the Diagram pane. The WHERE clause shows the Filter information you added to the Criteria pane. The WHERE clause, in this case, is not the usual one column equals one value that you've seen so far. The SQL generated by the Query Design window can be overly verbose. It has added a parenthesis around the WHERE clause. A parenthesis in SQL Server, like one in math, can change the order in which expressions are evaluated. If you had multiple expressions in your WHERE clause, placing some of them in parenthesis can affect the order in which SQL Server will evaluate the WHERE clause, but in this case, it's completely unnecessary. Since the column in question, TransactionDate, is a Date data type, you have to deal with the fact that you're typing a string with a date value, not an actual date. The Query Designer has done this by using the CONVERT function to make the string into a DATETIME value because that is the lowest common denominator when dealing with dates and times. There are better ways to do this, and we'll explore them in later articles in this series. Finally, the ORDER BY clause shows the column you selected to order the results by and the direction of that ordering, DESC for descending. You can click the OK button now. The window will close and the T-SQL statement will be moved directly into the Query window in SSMS. You can now execute your query, us the keystroke CTL-E, to see the results in the Results tab. You'll see only the columns defined and the data will be ordered in the direction you specified. That's the basics for using the Query Designer to build a query for you. However, as you saw, this is just a method for generating a T-SQL statement. You can generate that T-SQL statement yourself and save yourself a little time and provide a lot more control. 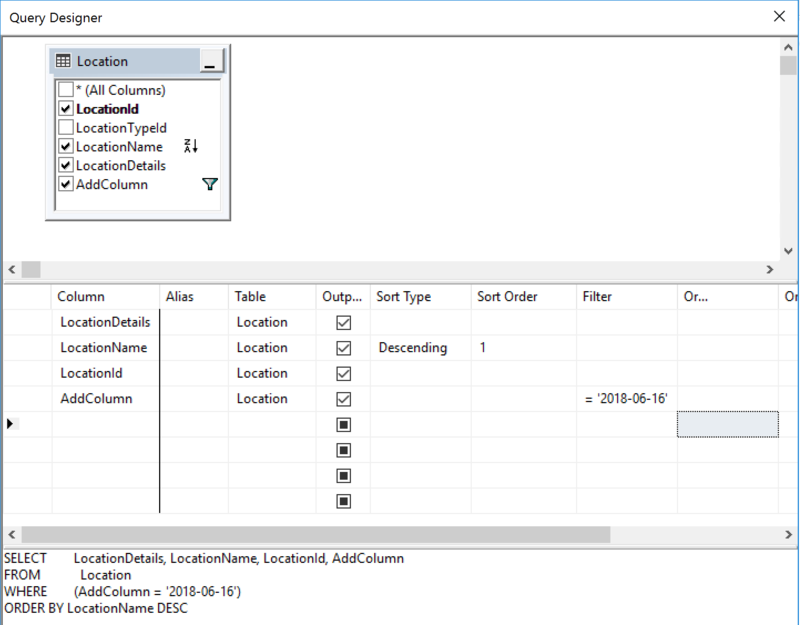 However, the strength of the Query Designer is the fact that it will show you the T-SQL as you select tables, columns and define criteria like a FROM clause. The Query Designer will even provide JOIN criteria. This makes the Query Designer a good way to learn T-SQL for some people.